Gunmen from rival Palestinian factions are continuing to trade fire in the Gaza Strip as their deadly power struggle shows no sign of abating. Gunfire and exploding grenades could be heard in Gaza City early on Sunday. Fighting between the governing Hamas faction and its political rival, Fatah, has left at least 22 dead since Thursday, the worst violence in months. The clashes have halted attempts to hold talks on forming a Palestinian national unity government. Witnesses said Sunday morning saw further clashes in Gaza's densely populated streets, but there were no immediate reports of casualties. In the latest violence, a bomb blast damaged the house of a bodyguard working for Fatah strongman Mohammed Dahlan. Overnight, five more people died, including a young boy who was hit during a shootout between Hamas and Fatah in the northern Gaza Strip. They speak responsible words and yet the fighting continues. The clashes of the last few days erupted after weeks of relative calm. The two factions had been making renewed efforts to form a national unity government to satisfy the demands of international donors. The US and the European Union froze funding when Hamas, the largest Palestinian militant Islamist organisation took office last March, demanding that Hamas renounce violence and recognise Israel. Friday was one of the worst days of violence between the two factions' supporters since Hamas defeated Fatah in last year's Palestinian elections, with at least 13 people reported killed. Both sides have blamed the other for the outbreak of violence and say they have suspended their talks. The discord has been condemned by the Arab League, the Organisation of the Islamic Conference and Egypt's Muslim Brotherhood, which said: "They speak responsible words and yet the fighting continues." There has been intensive mediation by Egyptian diplomats to try to stop the bloodshed. The UN's Middle East envoy Alvaro de Soto called on all the factions "to cease clashes and comply with international humanitarian law by refraining from acts which endanger civilians". 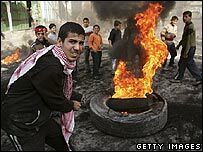 The violence also showed signs of spreading to the West Bank, where Palestinian police clashed with about 200 Hamas supporters on Saturday.